Welcome to the magical world of scales, a fantastic resource for the creation of music. 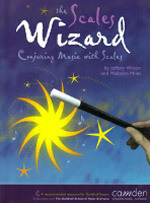 Welcome to the magical world of scales, a fantastic resource for the creation of music. Inside you will find information on different types of scales, ideas on how to practise them, suggestions for group activities and a variety of approaches to composition and improvisation. As well as being a valuable resource for music teachers, music students will also find much in the way of useful material. You will see ideas in the Scales Wizard suitable for musicians of all levels of ability and experience, from beginners upwards. A CD of accompanying material is also available.